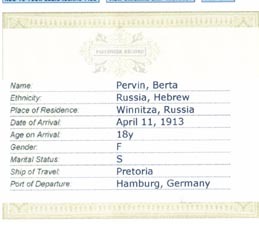 According to the ellisisland.com, Berta Pervin arrived at the Ellis Island on April 11, 1913. She was listed as 18 years old, and came from Winnitza, Russia (possibly current Venniytia, Ukareine) by "The Pretoria". 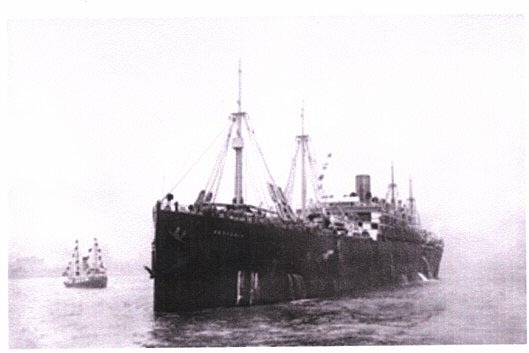 The original Ship Manifest listed; 1) She was a dressmaker, 2) her destination was 72 Brown St., Pittsburgh, PA., and 3) Morris Kyrar is referred as for her sponsor. A hand written reads "br.i.l" in the column of her relationship to the sponsor. Debroah Scheimer suggests "br.i.l" should read "Brother in Law." Dr. Yuri A Pervin suggests to read the last name for Morris "Kuper"